By Alistair Reign, February 3, 2016. Colour of War Campaign. In less than one year of civil war more than 21 million Yemeni people need some type of humanitarian assistance to survive – the equivalent of over 80 percent of the population; the life-threatening food, water and medical crisis is made even worse by the fact that about 2.3 million people have lost their homes and livelihood due to airstrikes, orphaned children sleep on the street, and families live on the rubble of what was once their home with no means to provide for surviving family members. Mona Relief Charity on Go Fund Me makes it easy and safe to donate. No amount is too small, or too large. “The suffering that this conflict is inflicting on people is heartbreaking. I hear first-hand accounts of it whenever I speak with women, children and elderly people who have made the perilous crossing to reach Djibouti, Ethiopia and Somalia,” said Claire Bourgeois, UNHCR’s regional refugee coordinator for Yemen. A Picture And Its Story: A Life in The Balance: The mother of 21-month-old Majed Ayyash prepares him to be weighed in a malnutrition intensive care unit in Sanaa, Yemen July 30, 2015. 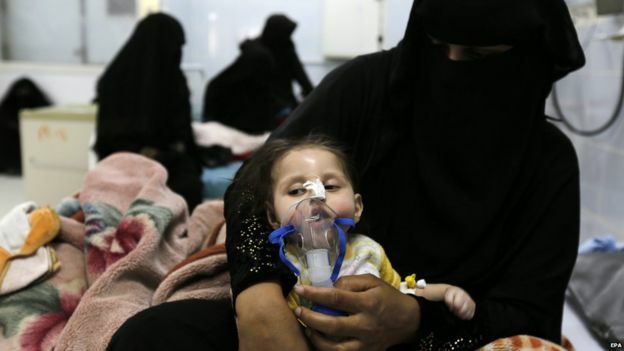 Damaged by a lack of skilled medical care at a critical moment, many infants struggle for life in a hospital in the bomb-damaged capital Sanaa. (Photo: Reuters/Khaled Abdullah). Mona Relief Charity on our Go Fund Me makes it easy and safe to donate. “Mothers have been forced to watch their children slowly disappear to the cruelty and torture which is hunger. A Yemeni woman helps her malnourished child to breathe at a therapeutic feeding centre. “Those mothers whose hands were always open in an eternal act of offering to their kin, have now been closed in anguish. “Mothers’ hands are all but empty, mothers’ hands – those hands which once wiped away tears and consoled their little ones stand idle, barren – like, the land which now witnesses a people’s sorrow. “When not even mothers’ hands can bring comfort and hope, what left is there? “The Mona Relief Organization is fighting to keep hope alive – but this one organization cannot possibly do it alone, its volunteers cannot possibly defy injustice and defeat poverty by themselves,” writes Catherine Shakdam, Mona Relief Charity. Yemen needs not handouts but the means to build a better future, one which war stole. PLEASE GIVE GENEROUSLY AND #SaveALifeInYemen TODAY. Mona Relief Charity on our Go Fund Me makes it easy and safe to donate. No amount is too small, or too large. Thank you on behalf of the Yemeni families who are relying on the worlds’ humanity, as they struggle to survive in their darkest hour, they cannot do it alone.